I pretend to be tired of Frozen. After endlessly watching the movie, reenacting the scenes, and listening to the soundtrack…after stocking a wardrobe with Frozen attire and filling a playroom with Frozen toys… I realize that another dramatic interpretation of “Let It Go” by our beloved 4 year old should send me screaming in search of sanity. The terrifying truth is… I am not tired of Frozen… or the Little Mermaid, or Tangled, or Beauty and the Beast, or Cinderella. I do understand how totally crazy and completely inappropriate so many of these princess stories are for our kids. I mean – I am desperate to raise well-rounded, competent, compassionate, intelligent, and independent, young women who are prepared to tackle the complexities of a global society that honors and respects equality and social responsibility. But… I feel the love and really can’t shame the obsession of Disney princesses. I am so thankful for Elsa and Anna who make me feel a little less guilty about our love of princesses. 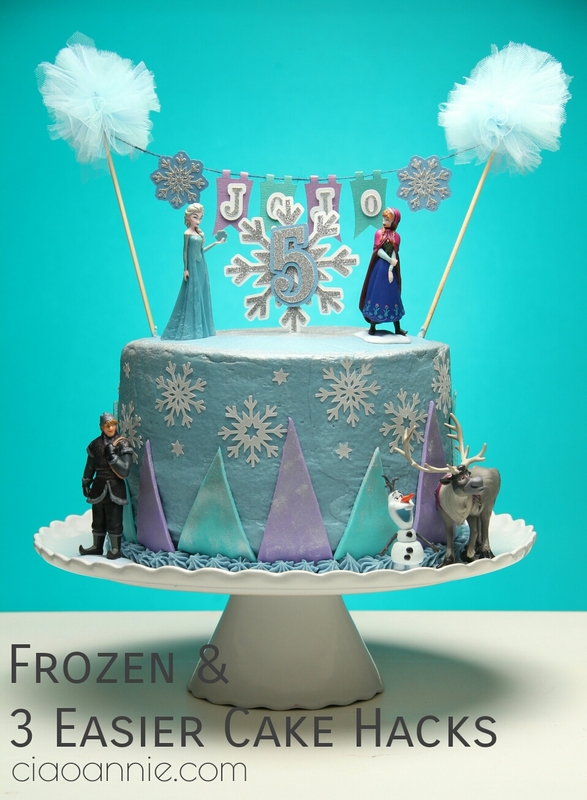 Turns out this may be the strangest intro to… I made another Frozen cake and learned some new tricks to simplify my cake decorating! Forget the fondant and frost with buttercream (sometimes)! Wilton Pearl Dust (available at Michael’s, Jo-Ann’s, Amazon, etc.) is fabulous for adding a little sass and hiding imperfections. As I mentioned this was my first attempt at the VIVA paper towel frosting method, so it was definitely not perfect by any means. Not everything has to be edible. I love the challenge of making everything on a cake edible, but I am trying to simplify and let’s be serious – no one is actually going to eat a fondant Elsa, a gumpaste Anna, or an Olaf made out of modeling chocolate. I cleaned our Frozen figurines and topped the cake. I actually got out two bowls, one with soapy water and one with clean water, and had our 3-year-old Samantha give Anna, Elsa, Olaf, Kristoff and Sven baths, which she thought was pretty much the greatest thing in the world! Confession of a *wannabe* everything… I’m sure it would be super helpful to see before and after pictures of icing a cake using a VIVA Paper towel, but I blew it! You can see pretty great documentation of the paper towel trick Frost Me Up. « Ciao Annie Redesign… Again!